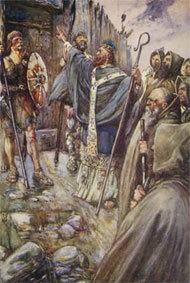 St Columba also known as Colmcille was born on the 7th December 521 in Gartan, Ulster (in today’s County Donegal). His father, Phelim McFergus, was a great grandson of Niall of the nine hostages and his mother, Eithne, was from a noble family of Leinster. As a young child he spent most of his time at the nearby little church and was called Colmcille meaning “little dove” a name he is still known as in Ireland. He first studied at Kilmacrennan and with the Druidic tradition collapsing in Ireland due to the spread of Christianity and the study of Latin and Christian theology flourishing Columba was sent onto study at the monastic school of Moville. After his training at Moville he moved onto Clonard monastery where his studies was led by St. Finian and he was ordained as a priest by the Bishop of Clonfad, Saint Etchen. Was Columcille’s first monastery in Derry? Its believed that after leaving Glasnevin monastery St Columba travelled North to an area called Doire Calgach (oakwood of Calgach) known today as Derry, the oldest continuously inhabited places in Ireland, where he supposedly founded his first monastic Church known as Dubh Regles (The Black Church) in 546 AD. Local historians believe though it wasn’t until later a Christian monastery was founded on the hill of Derry after a local King donated the site. Although the monastery belonged to the federation of Columban churches who seen St Columba as their spiritual leader its believed the church was have been very small at the beginning but may have lasted into the middle ages and evolved into the Augustinian congregation. Tradition states that Columba disputed with St. Finian of Moville over a psalter (a volume containing the book of psalms and other devotional material). Columba had borrowed the book from St. Finian and had copied the manuscript intending to keep it but St. Finian disputed his right to keep the copy. You could say this was possibly the first case of law against copyright. Around the same time Diarmaid executed a young prince of Connaught who was under the protection of Colum Cille which angered the Northern Clan Neill and the Connaught men. In revenge they fought King Diarmaid in the Battle of Cul Dreimhne in 561 AD who had lost over 3000 men. Two years after the Battle of Cul Dreimhne Columba set sail for the island of Iona with 12 other colleagues. On Iona he founded a monastery that became famous as a centre for Celtic Christianity, many believed this is where the Books of Kells had been created. Columba travelled to mainland Scotland but on visit to King Bridei of the Picts he found the gates of their stronghold bolted shut. On performing the sign of the cross the gates flung open on their own accord which was seen as a miracle by many. After this King Bridei decided to listen to Columba and was then Baptisted with many people soon following. He spent the rest of his life travelling Scotland and preach to whoever would listen. Whenever he wasn’t travelling he would return to Iona and led a monastic life and teaching the word of the lord. 8th June, 597, Saint Columba passed away in Iona where he was buried. 100 years later his remains were removed to Ireland after the threat from Vikings but to this day nobody knows their exact location. Without a doubt Saint Columba was a remarkable person who travelled all over Ireland & Scotland helping to spread Christianity and was responsible for the founding of many churches and monasteries in Ireland. His feast day is celebrated on 9th June.